My initial champorado thoughts stem from cold, foggy, and sometimes rainy morning memories. These mornings, I would wake up, make my way to the kitchen, then find a metal pot resting on the stovetop. Jackpot... my mom made heaps of warm, chocolatey goodness for breakfast. Rather than the brown sugar oatmeal fix that I frequently exploded in the microwave, my family's champorado is so much better than the instant stuff. 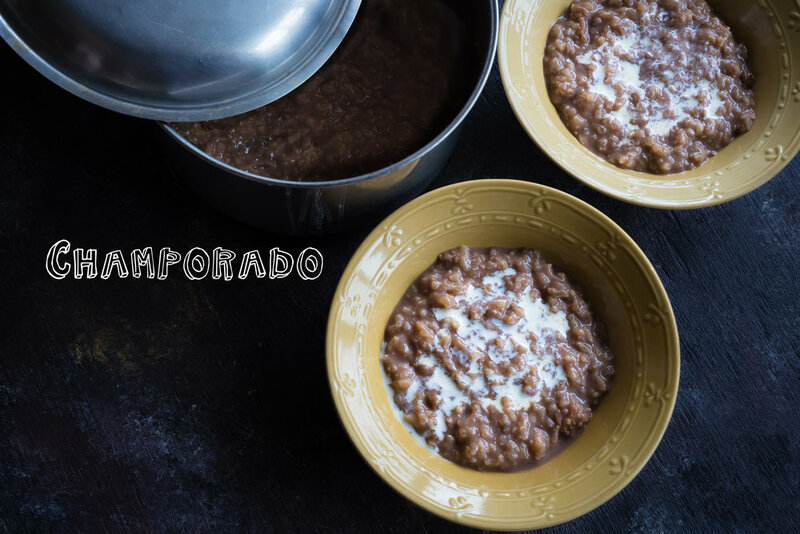 What is champorado anyway? 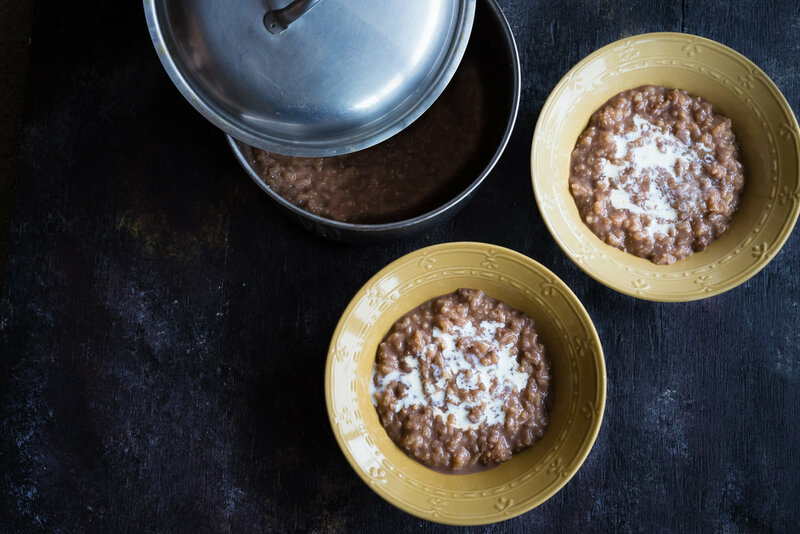 Champorado is a chocolate rice-based porridge that stands as a beloved Filipino breakfast staple. It's soft, gooey, sweet, and everything else my heart would imagine the ultimate comfort food would be. Traditionally, the dish is made using malangkit (sticky rice–further explained in Sweet Potato Buchi and the Rundown on Glutinous Rice), water, sugar, and tablea (chocolate tablets). Last week, my mom taught me how to cook a healthy version of champorado with a recipe adapted from my lola's (grandma's) traditional way of cooking. The recipe will be at the bottom of this post per usual. Map 1: Spanish Trade Routes. Traditional champorado is made with tablea, and tablea for that matter, isn't native to the Philippines at all. 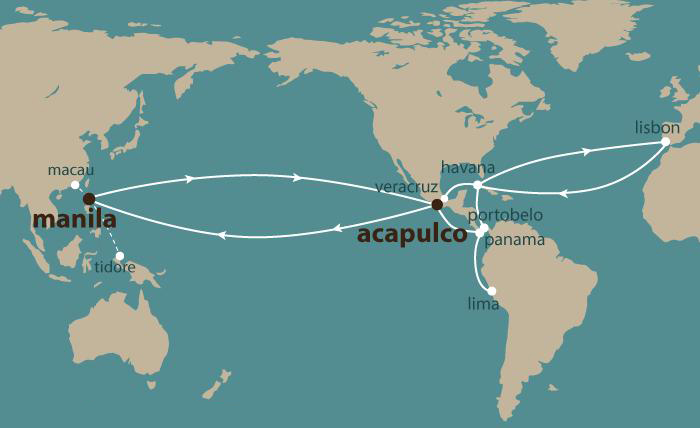 Around the 1670s, Spanish colonizers brought cacao trees from Acapulco, Mexico to Manila, Philippines by way of galleon ships. This trade is known as the Manila Galleon Trade, whose ships arrived in Manila from 1565 through 1815. I do want to point out that this wasn't a happy-go-lucky period when Filipinos (previously known as Indios Luzones on the island of Luzon) benefitted from 250 years of exchange and wealth. The Spaniards used Manila as a major port so that they could be part of an existing trade network; the trade itself, only fulfilled the interests of the privileged few who were full-blooded Spanish governors, members of the consulado (merchants handling foreign affairs), and residents of Manila. I bring this to light because I think it's important to understand that colonization wasn't a time when existing cultures peacefully shared their customs and traditions with one another. The Spaniards' customs and traditions were forced onto the people of the Philippines even though Filipinos already had their own cultural structures in place. Also at this point in time, goods from Acapulco were reserved for the Spanish elite and Filipinos weren't given the right to enjoy things like chocolate. Map 2: The Cacao Belt. As the Spanish colonized, cacao traveled to feed the appetites of the colonizers. I learned that cacao trees originated in the Amazon basin and traveled as far as Mexico during Spanish colonization. The Philippines was the first country outside of the Americas to receive the cacao tree and provide climates for it to thrive and move westward. If it wasn't for the Philippines' location in the cacao belt (see Map 2), we most likely wouldn't have the global chocolate industry we currently have. Cacao trees were used to make hot cocoa for wealthy Spaniards to enjoy; however, not long after Spanish rule, Filipinos started growing cacao trees in Laguna, Cebu, and Bohol and making their own version of hot cocoa called "tsokolate." Tsokolate is a hot chocolate drink made from water, sugar, and tablets of ground cacao nibs; the word comes from "xoco-atl," a chocolate beverage said in the Nahuatl language of the Aztecs. In the video below, you can watch the step-by-step process in making traditional tsokolate, which is champorado without the malangkit. Malangkit was maybe later added to make tsokolate heartier and more filling to the stomach. Fill your large pot with 2 cups of rice and 6 cups of water and bring to a boil on the stovetop. Once at a boil, reduce the heat to low and simmer until the mixture starts to thicken. Continuously stir in this process so that rice doesn't stick to the bottom of the pot and burn. Once the rice is cooked and achieves the consistency of Photo 1 below (about 15 minutes), add your 4 cups of milk to help loosen this mixture and create a creamier champorado texture. Allow the milk to heat up in the pot. *Adding milk later on in the rice cooking process ensures that the contents of your pot don't burn. Dairy burns easily and will cause your rice to bubble over. At this point, the rice shouldn't have absorbed all the milk. Scoop about a cup's worth of hot milk into a separate cup and add your 2 scoops or organic protein powder. Stir until fully combined and add to your larger mixture on the stovetop. This ensures no clumps forming. Once your milk has created a texture you want, stir in your 2 packets of sugar and 2 teaspoons of instant coffee granules. Take your champorado off the heat and serve warm. Top your bowls with evaporated milk, mix in, and enjoy! *My family tops our champorado with evaporated milk. You can also use sweetened condensed milk to make it more decadent. *Tablea is difficult to find in the States, so use chocolate powder as a substitute here. *Champorado is usually eaten with tuyo (salted dried herring). The sweet and salty pairing are a match made in heaven. *To reheat, add a splash of milk or water before microwaving to loosen the rice. Photo 1: The rice consistency you want to achieve before adding your milk. Photo 2: Warming the 4 cups of milk. Photo 3: Combining the organic chocolate protein powder in a separate cup. Photo 4: Fully prepared champorado. The rice grains will start to absorb the liquids at it sits.